The deadline date for accepting entries into the 2006-07 English Schools' FA U15 Inter Association Trophy was on Saturday 24 June 2006 at the Annual General Meeting in North Lincolnshire. This season's Trophy will once again be sponsored by the National Union of Teachers. It will be the third successive season that the N.U.T. has supported this competition. 136 entries have been registered for next season's competition. Liverpool Schools' FA will be looking to defend their Trophy after the beating Swansea 2-0 on aggregate in last season's two-legged final. The first leg was played at Swansea City's Liberty Stadium and the second leg was played at Anfield, home to then, European Champions, Liverpool FC. The N.U.T. 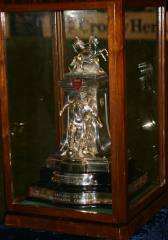 Trophy currently resides in Liverpool Football Club's Trophy Room alongside the FA Cup and FA Youth Cup. It is believed to be the first time all three trophies have been held by a city / town. The draw for next season's Trophy will be published here within the next few days.